What is widely considered to be the “classic” Iron Butterfly line-up was together but two memorable years, give or take a month, out of the five decades the band’s lengthy history spans. The foursome of founding band member Doug Ingle (vocals, keyboards), guitarist Eric Brann (nee Braunn), bassist Lee Dorman, and drummer Ron Bushy released a pair of influential albums circa 1968-69 that included a bona-fide classic in the form of In-A-Gadda-Da-Vida, the first album to be awarded Platinum™ sales status on its way to better than 30 million burgers sold worldwide. Still, in the annals of “heavy” music, Iron Butterfly is often overshadowed by contemporaries like Steppenwolf, Blue Cheer, and Vanilla Fudge, and when they’re remembered at all, it’s for the seventeen-minutes-plus of “In-A-Gadda-Da-Vida.” There’s much more to the band than their most famous song, however. Iron Butterfly’s 1968 debut album, Heavy, featured a different band line-up and is, overall, an unremarkable period piece – a collection of leaden flower-power pop and acid rock that, while curiously entertaining today, was easily lost amidst the late 1960s fray of psychedelia. While In-A-Gadda-Da-Vida, released in late 1968, displayed a slight evolution in the band’s sound, it was their third album – the vastly underrated Ball – that showcased Iron Butterfly’s talents and improved band chemistry by moving beyond the band’s psychedelic tendencies to embrace different colors in their sonic palette. Released in January 1969, Iron Butterfly pursued a more melodic song structure for Ball; the album’s material was more consistent than previous, Brann’s guitar solos sharper and more succinct, Ingle’s omniscient keyboard fills more complex and not overwhelming a song’s arrangement. Ball opens with “In The Time of Our Lives,” which was released as the album’s first single. The song disappointingly charted at #96, which is a shame ‘cause “In The Time of Our Live” features a highly atmospheric performance with sudden squalls of fuzzy guitar; Ingle’s chiming, sepulchral keyboards; and haunting vocals that create an eerie but cool Gothic vibe. “Soul Experience,” the album’s second single release, is even better even if it only peaked at #75 on the charts. With psychedelic guitars swirling around Ingle’s somber albeit soulful vocals, and a rumbling of drums, “Soul Experience” was loftier and more musical uplifting than anything the band done before. By contrast, “Lonely Boy” is a powerful torch song displaying an undeniable R&B influence in Ingle’s torrid vocals and smooth-as-silk, gospel-tinged keys. The song is a striking departure from the band’s normal psych-rock direction, its minimalist but loving instrumentation providing a near-perfect complement to Ingle’s voice. The equally subdued “In The Crowds” is cut from a similar cloth, the band’s complex instrumental backing providing a suitable canvas for Ingle to paint upon, but weak vocals and the song’s shockingly truncated two-minute running time don’t allow for full expression of the original creative idea. Ingle’s “It Must Be Love” is much more interesting, offering textured keyboard patterns and wiry fretwork that are built on a jaunty rhythmic base, and if Ingle’s understated vocals are too low-slung in the mix for most tastes, well, blame the producer. Another Ingle original, “Her Favorite Style,” is an undiscovered psych-pop gem featuring a quirky instrumental arrangement with a memorable hook, an intriguing rhythmic backbone, shots of sharp guitar and keyboards, and an unusual vocal performance that effectively frames the lysergic-fueled lyrics. The odd bodkins “Filled With Fear” shoots for the Goth feel of the album’s opening track, instead achieving a wild head-trip of spacey guitars and martial rhythms that create a whole different style of menace. Brann’s “Belda-Beast” continues to travel deeper into the band’s brave new world. A rare number sung by the guitarist, his breathless vocals are supported by Ingle’s multi-tracked, ethereal keyboards and splashes of colorful guitar. After the release of Ball, which rose to #3 on the Billboard albums chart and would later be certified Gold™, the band reconvened in the studio to record a pair of songs, the last from this Butterfly line-up. “I Can’t Help But Deceive You, Little Girl” displays a funkier, more soulful and entirely welcome new facet to the band, Ingle delivering a strong vocal performance, pounding his keys with reckless abandon while Brann lays down some imaginative guitar licks above a busy, jazz-flecked rhythm track. Released as a non-album single, the song only inched its way up to #118, which is another damn shame because its flip-side, “To Be Alone,” combines the best of the old-school acid-rock Butterfly sound with the more adventurous musical direction displayed by Ball, clever syncopated rhythms laid down by Dorman and Bushy providing a foundation for Brann’s soaring guitarplay and Ingle’s rapidly-evolving vocal style. The so-called “classic” Iron Butterfly line-up would only appear on one other album, 1970’s Live concert recording. Brann left the band after Ball, replaced by guitarists Mike Pinera (from Blues Image) and Larry “Rhino” Reinhardt for the studio album Metamorphosis. 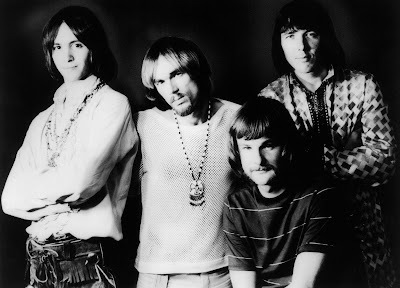 After Doug Ingle left the band in 1971, Iron Butterfly broke up, with Dorman and Reinhardt forming space-rock cult favorites Captain Beyond and Pinera forming the short-lived outfit Ramatam before landing in Alice Cooper’s band. Brann and Bushy put together a new Iron Butterfly in 1974 with various musicians, releasing Scorching Beauty and Sun and Steel – two albums featuring a vastly different sound – to overwhelming commercial indifference in 1975. 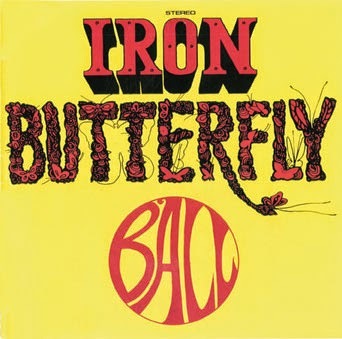 Various permutations of Iron Butterfly, helmed by drummer Bushy, have toured ever since, often including Brann, Ingle, and Dorman in the line-up.